Today I have a very special post for you. Freshly Made Sketches is celebrating their 200th sketch and they invited the Stampin' Up! Artisan Design Team to play along to celebrate! These sketches are great because they are simple, which leaves them open to a wide interpretation. 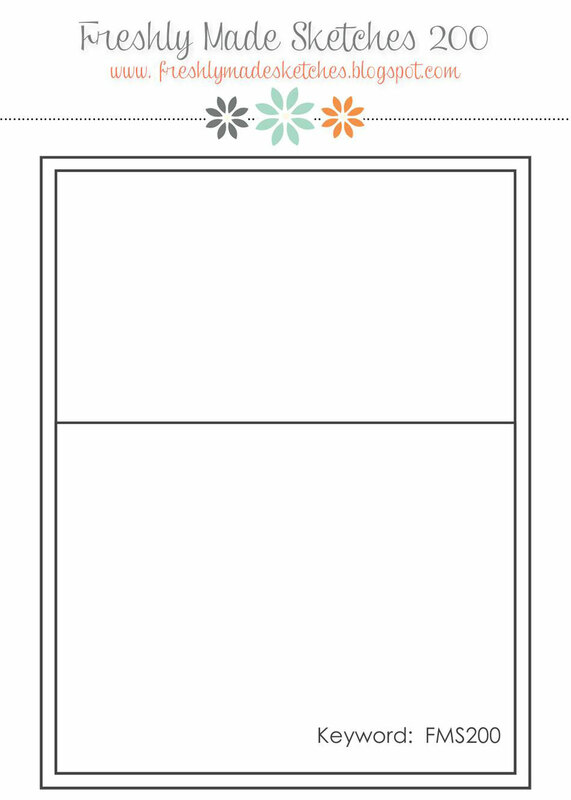 Since the sketches are simple, they lend themselves to really clean card designs. Right up my alley! The card that I made couldn't be any simpler. I used a pretty piece of the Into The Woods Designer Series Paper for the bottom part of the card and trimmed out a gold "grateful" with the Seasonal Frame Thinlit Dies. (Both the paper and die are from the upcoming Holiday Catalog.) I just added some of the coordinating ribbon and some doilies behind the sentiment and I was done! This was my first time playing along with Freshly Made Sketches, but I don't think it will be my last! Click on the sketch below to be taken to the celebration! You will definitely want to see what they have in store for you! This is so pretty! The paper is gorgeous and I love the luxurious look of the die cut sentiment. It's wonderful to have you join us as we celebrate 200 sketches. Such a fabulous way to show off that lovely paper! 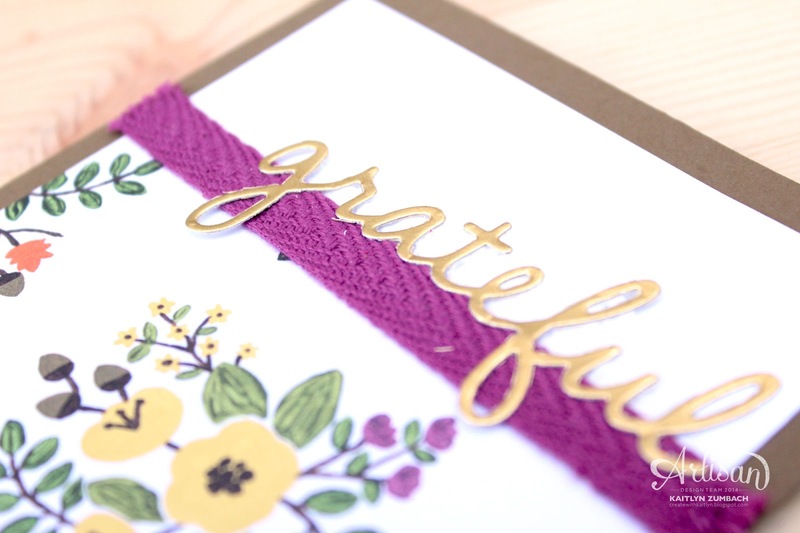 The golden "grateful" and the beautiful ribbon is a great look! Thank you for joining in the celebration of our 200th at Freshly Made Sketches! 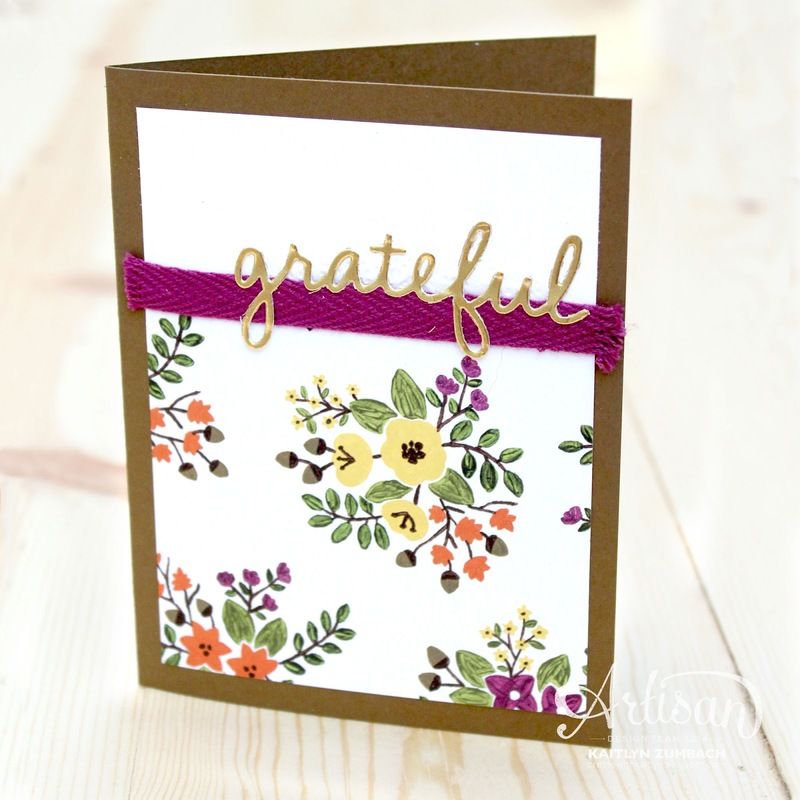 That DSP is beautiful and paired with the gold sentiment make for one classy card! Thanks so much for helping us celebrate our 200th sketch at Freshly Made Sketches! This is fabulous, Kaitlyn! Love that DSP and your pop of color from the ribbon. Thanks for joining our celebration at FMS! Beautiful card, Kaitlyn!! Love the touch of gold! I NEED that ribbon!